Dari Nowkhah is in. He talks about Kyler Murray's draft stock before getting into baseball and wondering if there will be a strike and what it might do. Mike Golic Jr. talks about the Anthony Davis news that rocked the NBA world last night before transitioning to talk about the Super Bowl Media Night and more. 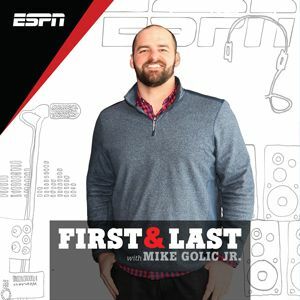 Mike Golic Jr. talk about the NBA All-Star starters before breaking down the article on the Cleveland Browns dysfunction and more. Mike Golic Jr. talks about James Harden going off last night against the Knicks before breaking down the season debut of Tiger Woods and more. Mike Golic Jr. talks about the Baseball Hall of Fame inductions and Mariano Rivera getting voted in unanimously. He also talks with Chiney Ogwumike and more. Kyrie talks about his apology to LeBron. Plus, Enes Kanter is fearing for his life. Chiney Ogwumike breaks down Golden State, and everything NBA related. Mike talks about Duke being upset by Syracuse. Kyler Murray's decision to enter the NFL draft, and the eyes that stole the attention in NY yesterday. At the end of the day... we got the best four teams. Plus, Mike's trip to Chicago to attempt a 43 YD FG went about as well as you'd think. Mike looks at what road teams have a chance to win this weekend. Plus, the Steelers may have hurt themselves this yesterday. Jets fans don't seem to be happy that they hired Adam Gase, but Mike wants to know who they wanted instead? The Cardinals go with a new face while the Bucs go with an older option. NFL teams looking for any connection to Sean McVay. Mike looks at Kawhi's return to San Antonio, another 40 plus for James Harden and a ton of football to look ahead to. Mike looks at which NFL teams have the best looking dating profiles for their next Head Coach. Plus, drama in Pittsburgh. LeBron wants Anthony Davis to join the Lakers, but do the Lakers have enough to trade? Plus, Ed Orgeron wants you to get off his lawn. UAB gets their first bowl win. People got left off the Pro Bowl roster, and LeBron got dunked on. The Saints win a low scoring game against the Panthers. Plus%2C James Dolan talks about if he%27d sell the Knicks. Mike talks about the Eagles great win on the road over the Rams before talking about other NFL storylines, fighting mascots and more. The Raptors may have won a big game against the Warriors, but the NBA is still heading for a lather, rinse, repeat situation. Plus, playoff expansion nonsense. We landed on the moon, right? Plus, Chiney Ogwumike joins the show for Women Crush Wednesday. Don't give me your defense excuses. That was bad football last night. Plus, 118 pages on Harper? You reading that? The Steelers let one slip away. Cooper is proving to be worth his price tag. The Heisman Trophy voting needs a upgrade and we find out what is Real and Fake in the NFL. Derrick Henry looked like a former Heisman winner last night. Plus, we thought we'd get a clear Heisman favorite last night, but Tua and Kyler split top honors. Mike talks about Urban Meyer's retirement, and the path to health for Markelle Fultz. Plus Chiney Ogwumike joins the show in studio for Women Crush Wednesday. How impressed can we be with the Eagles winning on Monday Night Football against Mark Sanchez and an old running back? The NFL did weird things yesterday. The CFB Playoff is set. Plus, Kareem Hunt sits down with Lisa Salters. The Saints struggled for the first time this season. We'll take seven of those Warriors/Raptors games, and the power struggle in LA. Oklahoma slides into the 5 spot of the CFB rankings. Will they still value Oklahoma over OSU after this weekend? Plus the Redskins proved once again talent trumps everything. The Texans showed up on the big stage, but what is their ceiling? Baker vs. Damien Woody, and could the Giants keep Eli for one more? There was press conference drama from New York to Green Bay. There was on the field drama with Baker and Hue, and tunnel drama in Buffalo. Craig Shemon in for Mike Golic Jr. He recaps the Thanksgiving NFL slate, preview rivalry week in college football and more. The Chiefs/Rams MNF game was so great that nothing else will ever be the same. It was the Mitch and Mack show on Sunday night. Plus, how do you like ND now? And the Saints... the Saints are good. As a Knicks fan, do you hope they donâ€™t win any more games this year? Also, should the Mets trade Noah Syndergaard? Will the Warriors get past the drama? Would Mike Leach win in a Pac-12 coaching brawl, and a raid in Pittsburgh. It's Wednesday and that means Chiney Ogwumike joins Mike in studio. The CFB rankings don't move, and the Warriors will still win a championship. Was the Giants win on Monday Night Football counterproductive to their tanking goals? Plus, the Jets are sticking with Todd Bowles. Did the Cowboys hurt their future by playing well in prime time? Baker Mayfield woke up dangerous, and the NBA stealing NFL headlines. The Steelers with the impressive prime time win, and Notre Dame WILL BE FINE. The Saints are pushing all in with Dez. The QB's in NY aren't having a great time, and Paul Finebaum... get outta here. What really happens if Le'Veon Bell doesn't show up this week to Pittsburgh. Plus, Dallas is left with more questions than answers after Monday Night Football. Mike isn't here for the strength of schedule argument for Michigan. Plus, a full slate of NFL action. Thursday Night Football was... well it was there. Mike previews a huge weekend of football, and reacts to J.R Smith wanting out in Cleveland. Tom Brady proves you are never too big to shout out your mom. Plus, the Warriors offensive record breaking night and why all eyes are on NY today. The Red Sox win the World Series. The Rams stay perfect in the NFL, and Mike Gundy makes fart noises. The Texans showed up last night. The Rockets are selling their future, and a major fry debate. The Red Sox go up 2-0 in the World Series and the Giants have a sale where everyone is invited. The Red Sox win game one of the World Series and Chiney Oqwumike joins us in studio. Spit gate continues and did the Giants trade the wrong Eli? At least the Giants are entertaining in their losses. Plus, the Amari Cooper trade caused pain to another ESPN Radio host, and the good and bad from LeBron. Mike Golic Jr. talks about the Chiefs dominant performance against the Bengals before talking about the NBA brawl, the tension between Eric Reid and Malcolm Jenkins & more. Was it interference? No idea! Plus, no more Peterman and the idea that was stolen right from Mike's mind. We had two MLB playoff games, two regular season NBA games and drama across the NFL and CFB. Mike tries to fit it all in. Mike responds to Peter Burns' ridiculous comments on Notre Dame. Plus, What the Packers need to improve on and we try to find the good for New York sports fans. The Chiefs score 40 pointes, but leave Brady too much time. The Steelers have a good problem with Bell returning, and what the heck happened on Saturday? Craig Shemon is filling in for Mike Golic Jr. He talks about the Eagles dismantling of the Giants on TNF and talks about the leash of Eli Manning before talking Jimmy Butler. From CC Sabathia to Lil Wayne there is beef all over the sports landscape. Mike is here for all of it. Where does the all time yards record put Drew Brees? Yasiel Puig needs to keep winning, and a twitter beef at 5am? Mike Golic Jr. talks about the Sunday Night Football game between the Texans and the Cowboys before talking about Odell Beckham Jr. and the craziness of the UFC and more. The Yankees win the AL wild card and save NY sports from disaster. Plus, is it a rivalry if only the Colts think so? A life changing lie changes how we feel about Kobe Bryant. The Rockies take 13 innings to win the NL wild card, and the state of New York rests on the Yankees. Patrick Mahomes is the real thing, so we try to figure out who he sounds like. It's Ed Orgeron. Plus, what's left in the fridge? Mike talks about the Early Thomas finger towards his team and how Le'Veon Bell reacted. Plus, a change for the Bucs, and no win streak for the Browns. Mike reacts to the Rams winning TNF. Plus, live sports? The Ryder Cup is happening. Another NFL game... more roughing the passer penalties. Kawhi laughs, and Baker to take control of the Browns. Are there only two teams in the NFL we are willing to say we know are good? Plus, it happened, it all happened... Tiger wins his first tournament since surgery. Mike talks about the NFL HOFers that want a salary and insurance for themselves. Plus, Cereal issues and solutions. The Bears win Monday Night Football behind an impressive defensive performance, but the jury is still out on Trubisky. Plus dad rants. From the worst call of the weekend to kickers who couldn't kick. Mike tries to fit in everything from a crazy Sunday around the NFL. Mike talks about the Bengals hot start to the season. Plus, what talent of yours would you risk $100,000 on? Are fans more worried about Aaron Rodgers than Aaron Rodgers is? Plus, Josh Allen gets the start and if you put milk in before cereal we can't be friends. Sam Darnold looks really good after his pick 6. Should Giants fans be jealous? Plus, the Mack-less Raiders come up short against the Rams. The NFL has returned! How did A ARON pull out a win against the Bears? Andrew Luck is good to hear from again, and the Redskins might be a playoff team? The sports world reacts to the Nike/Kaepernick ad. Real College Football rankings, and no more keg stands for Lord Stanley? Mike Golic Jr. talks about Colin Kaepernick as the new face of Nike before getting into Football at 5 as we have college and NFL football this weekend. Craig Shemon filling in for Mike Golic Jr. He talk about the biggest takeaways from NFL preseason before talking about Colin Kaepernick remaining in the legal game & more. Mike reacts to Ohio State suspending Urban Meyer for 3 games, and looks at the 23 page report that was released on the investigation. Has Baker Mayfield taken over the NFL world? Why the helmet rule won't ruin the NFL season, and a glitch in the NCAA transfer rule. Andrew Luck was back in front of his home crowd again. Are we headed for a suspension for Urban Meyer? Plus, the quads are back. Outside of all the conversation surrounding the new NFL tackle rule, we ask the important question... What's the best breakfast carb? Mike is scared that robots could take his job one day, and the thought of a Stugotz robot is amazing and really scary. Mike answers your fantasy football questions. Why Jim Furyk needs to just pick Tiger already. Plus, has an Alabama QB already been named? Mike Golic Jr. talks about the great run made by Tiger Woods yesterday at the PGA Championship before talking about the disturbing situation with Maryland Football. Craig Shemon is in for Mike Golic Jr. He talks about all the games in NFL preseason before talking about Tiger's chances at the PGA Championship and more. Craig Shemon is filling in for Mike Golic Jr. He gets into the NCAA rule changes, talk about the NBA schedule before talking about Tiger Woods in the PGA Championship & more. Yankee fans is it time to panic? They are three ahead of the Aâ€™s, 5.5 ahead of the Mariners; and Boston is just too good. Plus, why Owens should've gone to Canton? A Hall of Fame game, and a Hall of Fame debate. Should Phillip Rivers get into the HOF before Eli Manning? Mike looks at the timeline of events that lead to Urban Meyer being placed on administrative leave. The Mets lose 25-4 to the Nationals. MLB trade deadline moves, and the NBA is ready for the future. Mo Egger in for Mike Golic Jr. He talks about the MLB trade deadline and the questionable decision by the Astros to sign Roberto Osuna before talking about LeBron's school. Mo Egger in for Mike Golic Jr. He discusses the old, offensive tweets of Sean Newcomb and Trea Turner that were uncovered, dives into the new NFL rules and more. Mo Egger in for Mike Golic Jr. He talks about wide receivers Josh Gordon and Odell Beckham Jr. and continues to dive into the 2nd round of our Summer Take Bracket and more. Mo Egger in for Mike Golic Jr. He discusses Tiger Woods being in contention, President Trump's tweets and goes around the NFL with Football at 5. Mike looks at why it's a good thing for the HOF to gloss over T.O. Plus, Belichick vs. Popovich in our Summer Take bracket, and being front door famous is the way to go. Summer Takes bracket brings us two goodies today. Should college athletes be paid? Plus, is a hot dog a sandwich? The Summer Take bracket pins O-Line vs. D-Line today. Kawhi is First and Lasting this off-season. Plus, Serena doesn't want her daughter to play Tennis. We kick off our "Summer Take" bracket with two take offs. The Yankees or Cowboys are the best sports franchise, and will or won't the USMNT ever win a World Cup? The clock is ticking for LeBron to opt in or out of his contract in Cleveland. Plus, Jameis Winston officially suspended for 3 games. Will Kawhi Leonard agree to a trade and have key agents follow him? Plus, a blunder at the College World Series that may cost a team a title. Magic Johnson says he would step down as Lakers President of Basketball Operations if he can't land a big-time free agent this summer or next. Plus, World Cup drama! Mo Egger is filling in for Mike Golic Jr. He talks about the NBA Awards, LeBron not wanting elaborate pitches in his free agency and more. Mo Egger filling in for Mike Golic Jr. He covers LeBron having until Friday to decide if he will opt out of his contract, Kawhi Leonard's decision and more. Was it too late for Phil to say sorry, or is everyone ok now? Plus, how Kawhi and LeBron will affect the NBA Draft tonight. Is Kawhi hurting his public perception by staying quiet? Is Tom Brady hurting the Patriots? Plus, When you knew you were washed. How much money would it take for you to root for your rival? Could LeBron stay in Cleveland, and Juan Soto can time travel. The U.S Open's difficulty level was set to 12. Could we get a LeBrye mashup in the NBA, and the World Cup shook everyone. The 2026 World Cup will be the best party ever. We do big events well. Plus, Laker fans are crazy, and I told you about Zach Martin. Did Bob Meyers take a shot at Kevin Durant at their Championship parade? Alex Ovechkin is still drunk, and do NFL players have the right to hold out for a new deal? The Warriors are willing to give Kevin Durant whatever he wants to stay with Golden State. The phone call LeBron needs to make, and expensive pancakes. The potential loss of Shoehi Ohtani for the season is sad for all of baseball. The NBA Finals happened, but will Steph and KD be able to keep things friendly much longer? The Capitals win the Stanley Cup Final. The 76ers are on the hunt for a new GM, and T.O says N.O to the Hall of Fame. Mo Egger filling in for Mike Golic Jr. today. Mo talks about the Warriors beefing with Kendrick Perkins, the Capitals going up 3-1 and the refs roll in the playoffs and more. Mo Egger in for Mike Golic Jr. today. Mo recaps Game 2 of the NBA Finals and discusses what the Cavs need to do to get back in this series and more. J.R Smith's mistake may have ended the Cavs chances before OT even started last night. Dave McMenamin on the possibility of suspensions. Plus, a Spelling Bee happened. The 76ers are investigating if the burner twitter accounts are in fact linked to Bryan Colangelo. Plus, NBA Final preview take 4 and the Caps save to save their season. Mike Golic Jr. previews the upcoming NBA Finals and then discuss the bizarre story involving Bryan Colangelo and burner Twitter accounts and more. Mo Egger in for Mike Golic Jr. He talks about the Warriors beating the Rockets to advance to their 4th straight NBA Finals against the Cavs and talk Stanley Cup and more. Mo Egger is filling in for Mike Golic Jr. Mo talks about LeBron leading the Cavs to the NBA Finals yet again, previews the Western Conference Finals GM 7 and more. We got that close game we were looking for in the west. The NFL owners need to be careful, and does Kyrie want the Celtics to lose? Where were you for the Kyle Korver game? Can the "other" Cavs take this show on the road? Plus, what is the best debut for a pro athlete? BREAKING NEWS: Steph Curry is NOT injured. The Celtics and Cavs are liars, and the Golden Knights are the best story in sports. The Rockets even up the West with defense. Is Brad Stevens getting too much credit? Plus, what are the hardest things to do with a hangover? The Celtics go up 2-0 on the Cavs, as they somehow lost twice last night. Plus the biggest debate in Yanny vs. Laurel. The Warriors take the first punch in the Western Conference Finals. Plus, so many questions on the legalization of sports gambling. Boston ran away with game one, but it's what happens next that is most important for the ECF. Tiger showed his stripes on the weekend, and Brady wants to run? Tiger didn't have the start we wanted. Shohei returns with a homer. We feel sad for Jason Fitz this morning, and no brooms in the Bronx. Mike checks in to see if Philly fans are doing after they lose to the Celtics. Fake NBA awards sure to get Brad Stevens a win. And did we have too much fun at the Yard Goats? Mike Golic, Jr. joins Kayla Johnson, Tesfaye Negussie and Terrika Foster-Brasby to breakdown the NBA postseason including the 76ers' sweep survival and the Cavaliers closing out the Raptors. Also, we discuss SVG's departure from Detroit, the resurgence of the MJ/LeBron debate and much more. The Rockets will get to play the team they have been obsessed with for over a year. Tiger on LeBron gives you the feels, and all we can focus on is the Yard Goats. What can Toronto do this off season to get over the LeBron hump? Does it have to be Dwane Casey? Plus, Embiid was taunted and it didn't end well for the Celtics. We are one step closer to Rockets/Warriors in the west. It's about time Philly doesn't win, and horse studding facts. The Raptors needed to win game one with a tired LeBron. They didn't, and now it's over. Steph makes his return as the Warriors win again. Plus, you've seen Grease... right? Mike still trusts the process, but Al Horford was impressive. Plus, why it's never a good thing for offensive lineman to be trending on twitter. LeBron is tired, The Rockets look unbeatable, and the Browns draft results in horse poop? Houston drops 50 in the third, The Thunder and Jazz weren't very friendly and someone needs to get Giannis some tacos! No rest for LeBron in sight. Westbrook wants all the triple/doubles and curling isn't that hard. The masked man returns and Philly takes game three in Miami. Would you trade Ben Simmons for LeBron straight up? The NFL Schedule release means what? We all knew that LeBron performance was coming. We still can't find Playoff P. We openly steal "Pope or Fire" from Will Cain. We find out who Terry Rozier is. Kyle Lowry and DeMar Derozan are celebs who are just like us. Plus, Football at 5, and Mike hates cold games in all sports. Mina joins Mike to break down the NFL Draft. Mina also looks at Lamar Jackson and what everyone is missing with his talent. Wade looked like it was 2013 last night. Embiid is not happy with the process, and Mike eats a little Debbie Swiss Roll mid show. The Cavs lose game one to the Pacers. Lance Stephenson isn't likeable, and Paul George has the worst nickname in the world. Mike Golic Jr. talk about the NBA Playoffs starting and whether and talks Colin Kaepernick and more. Mike Golic Jr. reacts to the NBA Playoff being set and then breaks down the Yankees/Red Sox brawl before hearing the great Stephen A. Smith and more. Will the Rockets be content with not winning a championship? We need to pay attention to the reaction for Incognito, and Josh Rosen might be the most interesting man. Mike talks with Eric Mittenthal, the Vice President of Public Affairs at the North American Meat Institute. Why can't we put ketchup on our hot dogs? The latest with Andrew Luck's comeback. The NBA playoff picture makes the staff deal with math at 3am, and OBJ wasn't the only issue for the Giants. Patrick Reed wins the Masters. Does golf need a villain to fill the void? Plus, Shohei Ohtani has another unbelievable weekend. The first round of the Masters gave us everything we needed. Connor McGregor gets arrested. Plus, do we have a winner in the Kyrie trade? Mike talks about the Raptors chances in the playoffs. How you should keep your celebrations to your own athletic abilities, and why he's stuck in the middle of a war. Brandin Cooks gets traded to the Rams. Are the Thunder in trouble? Plus, twitter receipts for kids, Easter egg hunts with Saban, and things that make you cry. Donte DiVincenzo steals the night as Villanova wins the National Championship. Is Villanova the Golden State of College Basketball? Plus, Myron Medcalf joins the show. Mike celebrates the Notre Dame National Championship in what was an amazing Final Four for the women. Why Villanova is like the Spurs, and everything else you missed. The Yankees are must see T.V. Tim Kurkjian is the best at life, and Scott Foster will have himself the best day ever. Mike looks at the difference between being "The Yankee" and "The Giant" in New York. Plus, more fallout from the NFL rule changes. Mike looks at the new rules approved by the NFL owners. Should the Giants trade OBJ? Plus, friendship is bigger than basketball. Markelle Fultz makes his Philly return to a standing O and free Frosty's. What are your #FinalFourCereal suggestions? Plus, the latest with OBJ. Duke/Kansas was the best game in the tournament so far. How much does this Steph Curry injury hurt the Warriors? Plus, NFL owners meetings in Orlando. Loyola continues to be Cinderella. Kentucky got caught up in a handshake controversy, and Football at 5 with your latest around the NFL. The Cavs were shorthanded and got a big win against Toronto last night, and everyone wants seven of those now. Sam Darnold threw in the rain, and a car goes missing. The Rockets went streak snapping, and the Thunder lost to who? Who wins in a basketball game... *NSYNC or the Backstreet Boys? Plus, from one league to three? Mike reacts to ESPN The Magazine's most dominant athletes of the past 20 years. He creates his own top 10, and asks what you are top 20 at. Mike has returned to a mess of a bracket. Plus, watching sports via twitter for a week is interesting. Is Seattle selling off too much? The Rockets continue to roll, and how chocolate and donuts saved the day! The Rockets continue to win, but so do the Warriors. Plus, how warm should you keep your house in the winter? Mike Golic Jr. talks about Sean Miller denying reports that he had discussion to pay DeAndre Ayton, talks about the upcoming NFL Combine and more. Mike talks about how Jon Gruden wants to take football back to 1998, and if that is a good idea. Plus, Sean Miller's future in Arizona and Football at 5! Could we see a boycott of the NCAA Tournament? Plus, will we always complain about the catch rule in the social media era? Jerry Jones isn't the cool kid on the block anymore. The best take you'll ever hear on Kawhi Leonard, and... Floppy Pancakes. Mike tries to figure out the best way for college athletes to get paid. Plus, Blake Bortles signs a new deal with Jacksonville and LeBron James is Black Panther? The Cavs are done. Jk. Have the Olympics been successful for Team USA? Plus, more football! The women's USA Hockey Team wins gold over Canada. Plus, the Mavericks story continues to get worse. Mike talks about the NCAA erasing our memories again. Plus an update from South Korea including ice cream and donuts. Mike talks about the new MLB mound rules, and how there isn't a penalty for breaking it. Plus, fomo over the NBA All-Star game and a live update from South Korea. Would you rather try the skeleton or ski jumping? Julie Foudy joins the show live from South Korea, and do the Cavs have a cake walk to the finals now? The last thing the Cavs need is the All-Star break. A live update from South Korea. Plus, you better know what they really expect for Valentine's Day. The Warriors coach themselves against the Suns. Plus advise for the Cavs in their honeymoon phase. Mike Golic Jr. talks about the Cavs convincing win over the Celtics with their new roster and breaks down the Colts hiring of Frank Reich and more. Mike Golic Jr. talks about the crazy moves that happened at the NBA trade deadline and then breaks down the Eagles Super Bowl parade before bringing on T.J. Quinn and more. Mike Golic Jr. talks about LeBron James' dominate performance last night against the Timberwolves and then talks about the rivalry being back on between the Colts & Pats. Mike Golic Jr. breaks down Josh McDaniels saying no to the Colts job and returning to the Patriots, talks about if there is a possible mutiny in New England and more. Mike Golic Jr. tries to get to the bottom of the Malcolm Butler benching and also discusses where Nick Foles should go and the trouble for the Cavs and more. Mike Golic Jr. breaks down the Eagles win over the Patriots in the Super Bowl. He looks at the impressive play of Nick Foles, what this could mean for the Pats and more. Gronk will be on the field and at full force for the Super Bowl. Mike answers the five biggest questions for the game, and gives his final prediction. Could LeBron actually go to the Warriors next season? Would you rather have Tom Brady or Bill Belichick? Where is Red Panda's unicycle? Mike is all by himself on radio row. Alex Smith is going to Washington, and no Love for Cleveland. Mike talks about Blake Griffin getting traded to Detroit. Plus, another Super Decision and why every mascot should be a dog. Mike kicks off Super Week by looking at how the best of the best in sports are older than everyone else. We know what happened in the All-Star draft right? Plus, will the XFL actually take off? Super Decision... Would you rather, Be a HOFer but never win. Or, Rarely play and win a SB?